On Monday morning police and military staff arrived to find AWE Burghfield in Berkshire, Britain’s nuclear-bomb factory, blockaded. 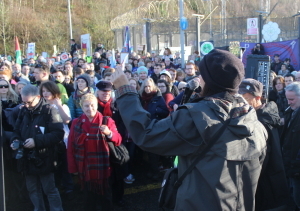 150 campaigners from the across the UK and Belgium, Finland, France, Spain, and Sweden shut down entrances to the facility by locking themselves together with arms tubes set in concrete. The site is run by a private consortium, Atomic Weapons Establishment (AWE), which includes Lockheed Martin. 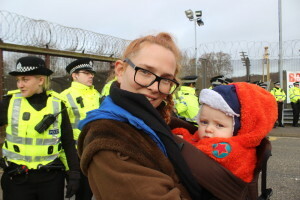 “Burghfield Lockdown”: a month of blockades and peaceful direct action is planned at the site to protest against the UK Government’s plan to spend £100bn on a new generation of nuclear armed submarines. Trident renewal is supported by Labour, Conservatives and the Liberal Democrats, but opposed by the Scottish National Party and Green Parties, among others. 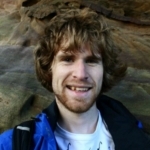 In Scotland peace groups are hoping to raise the profile of trident during the General Election campaign. 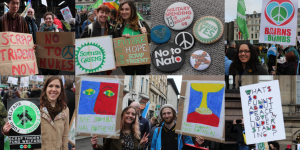 The Scrap Trident coalition is preparing for a march in Glasgow, 4 April and a blockade of Faslane, Britain’s nuclear submarine base, on 13 April. The action at AWE Burghfield recieved messages of support from actor John Hurt, Director Ken Loach, and Bishops Thomas McMahon and Paul Bayes. The Morning Star reported that the blockade lasted almost 10 hours.